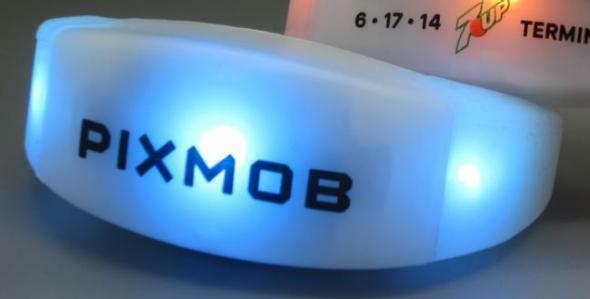 PixMob, the company behind the LED bracelets on Taylor Swift's 1989 tour, explains how they work. How Do the Light-Up Bracelets on Taylor Swift’s 1989 Tour Actually Work? Taylor Swift’s 1989 tour has thus far featured quite a few surprises, including appearances from members of the U.S. Women’s World Cup soccer team, a Lorde cameo, and an unexpected duet with The Weeknd. But perhaps the most magical touch: upon entering the concert, every fan gets an LED wristband—a translucent silicone bracelet that lights up and changes color perfectly in time to the music. Their integration into the show was so striking that New York magazine’s Lindsay Zoladz even wondered if perhaps Swift was controlling the wristbands with her mind. Not quite. They’re actually designed by a company called PixMob, which uses infrared transmitters to allow the bracelets, which can also be fitted with an RFID (Radio-Frequency Identification) chip, to be synced to each show’s music, lighting, and even the movement of people in the crowd (the bracelets are also motion-sensitive). * Slate spoke to PixMob’s commercial director, Jean-Olivier Dalphond—who is strictly forbidden from divulging any specifics of his contract with Taylor Swift—but was able to break down how the wristbands work. So how do these bracelets magically flash in time to the beat of Taylor Swift’s music? We use infra-red light, which is essentially the technology that’s in your remote control. It’s very simple but very powerful—think of it as installing a very powerful set of remote controls around the stadium, and then sending a signal that triggers the lighting. We use, essentially, invisible light to create visible light, and to synchronize people with each other. We want to make an object that feels like magic, so there’s no button, there’s nothing to activate—it will just turn on at some point. We want to surprise you. Who coordinates when the wristbands flash? We are integrated into the production, so whoever uses PixMob decides what they want to do with it. We leave it to the creativity of the client to work with. The light is controlled by the main lighting board. In 2010, Cirque du Soleil came to us with this crazy idea: Could we paint on an audience and light people up? We had two months. And we figured it out. We found a way to control individual objects. And then you decided to try bracelets? What we did with Cirque de Soleil was a poncho. We did the poncho, then we did the PixMob balls for Arcade Fire, then we did little helicos that dropped from the sky, and eventually we went to the wristband. We went from the big form-factor to something that was possible to wear easily and comfortably in public. With technology, it’s a little bit like how you start with the phone in the 1980s—it was giant. Now [a phone] can be very small and fit in your pocket. So we started with bigger objects and then made it smaller and smaller and smaller. Did you hear the news story about the three girls who got into a car accident after a Taylor Swift concert and used their PixMob wristbands to attract help? Everybody in the office was like, wow, that’s a great story. We don’t wish that on anyone, but we’re glad that the situation ended well. *Correction, July 20, 2015: This post originally misstated that the wristbands used during Taylor Swift’s 1989 tour were fitted with RFID chips. They were not.